On May 20-21, 1927, Charles Lindbergh literally flew into history when he crossed the Atlantic Ocean in his Ryan NYP Spirit of St. Louis, thus becoming the first pilot to fly solo and nonstop from New York to Paris. This flight made Lindbergh a household name and catapulted him into fame and celebrity. The objects of popular culture in the National Collection display everything from ashtrays to wristwatches reflect the public adulation for Lindbergh and the powerful commercial response to his celebrity. More than 75 years after the Spirit's historic flight, Lindbergh's name still has the power help sell manufactured goods. Gift of the Stanley King Family. A gray sweatshirt with an image of Lindbergh wearing a flight jacket, cap and goggles. Left of Lindbergh is an image of a skyscraper with the words "NEW YORK" below. Right of Lindbergh is an image of the Eiffel Tower with the word "PARIS" below. An orange series of dots connects these two images behind Lindbergh. Just to the right of Lindbergh's head is an image of the Spirit of St. Louis. 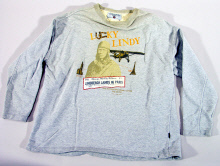 Above Lindbergh text that reads "LUCKY LINDY" the U and C in LUCKY are created by two horseshoes. Below Lindbergh is a white rectangle with the headline from the Chicago Sunday Tribune "LINDBERGH LANDS IN PARIS"